Auro 301 Natural Plaster Primer is designed for priming absorbent or uneven bare plaster before painting. Ideal for use on gypsum plasterboard and gypsum fibreboard and mineral interior plaster. Materials which are highly or unevenly absorbent, such as gypsum plasterboard, should be pre-coated to achieve a uniform painting result. This avoids uneven, dull patches on the walls. The best primer to use before applying dark colours onto new plaster. Auro 301 is a highly breathable primer, so ideal in older buildings or and before painting with lime based or other breathable paint products. This non-toxic primer has a milky appearance that dries transparent. This is a concentrate that you dilute 1:1 with water before use. People with allergies or who are MI sensitive will be happy to know that, thanks to Auro's ecological choice of raw materials and compliance with the strict AgBB criteria on emissions (a German evaluation scheme for VOC emission from construction products), this product is a designed to be suitable for allergy sufferers. Apply with a brush, roller or spray. Drying time: Overcoatable after approximately 4 to 6 hours. Please note: For an interim period, the older version of the Plaster primer no. 301 may still be available in retail. The new formula product can easily be identified by the REPLEBIN® icon on the label. Due to the different binding agents, the two versions must not be mixed together. Natural products are neither odourless nor emission-free. The use of natural and plant based ingredients means that allergy and asthma sufferers and people who are chemically sensitive are much more able to tolerate Auro products, however they may cause allergic reactions in some. For more detailed information download the Auro 301 Technical Datasheet and 301 Safety Data Sheet (opens in new tab). 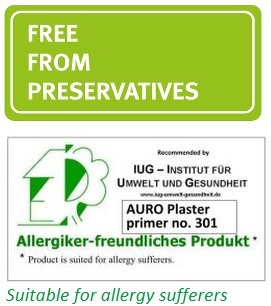 Auro 301 Plaster Primer is certified as "Allergy Friendly" from the German IUG (translated to: Institute for Environment and Health) because it has features that are particularly favorable to people with allergies. View the Allergy Friendly Certificate - page 3 for Auro 301 (opens in new tab). Brushes can be cleaned with Auro 411 Natural Brush Cleaner if necessary. Click the button below to add the Auro 301 Plaster Primer to your wish list.